Foley Park was named after Dr Horace Foley, medical practitioner and controversial local Mayor. The Wireless House in the park was built in 1934 to provide radio broadcasts during the Depression. Foley was a medical practitioner, local Councillor (1934-39) and controversial Mayor (1937-38). As a doctor during hard times, he often treated the poor free of charge. (His former surgery is at 202 Glebe Point Road, 1932-79.) His actions as Mayor were more questionable. He was convicted under the Local Government Act 1919 and disqualified from holding office for 7 years. Glebe Council was subsequently dismissed and the suburb came under the administration of the City of Sydney Council. Built in 1934 by Leichhardt Council in order to provide radio broadcasts in the park to the local community at the time of the Great Depression when wireless sets were too expensive for most people. 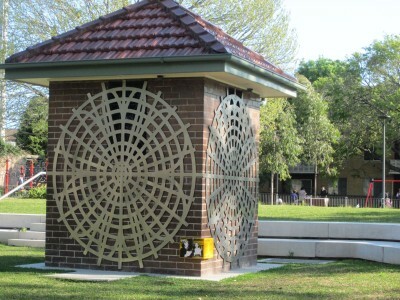 The Wireless House has been ‘sonically re-activated’ by artist Nigel Helyer who created the modern artwork around the Wireless House and developed the concept of using the building as a free internet hotspot and a place to play old audio recordings including oral histories relating to Glebe. Foley Park was the location of Hereford House, built in 1829. It became a Teachers Training College in 1911, and was demolished in 1929. Hereford House is where district court Judge William H Wilkinson lived. Ley became a solicitor after cultivating a friendship with Wilkinson. Following his marriage, Ley lived at a number of addresses in Glebe Point Road. The Leys moved to the developing suburb of Hurstville and Tom moved from local to State and then Federal politics. Unfortunately his opponents had a habit of disappearing without trace. Before Ley sailed for England with his mistress, he had been a suspect in the deaths of at least three people. In the UK he was convicted of a murder in that jurisdiction and committed to an asylum for the criminally insane.